Anaheim Ducks coach Bruce Boudreau had the pleasure of watching another Olympian wear a Ducks jersey Friday during practice at The Rinks in Anaheim, Calif.
Hilary Knight, a two-time U.S. Olympic silver medalist, practiced with the Ducks as part of World Girls' Ice Hockey Week. The 25-year-old is in town to support USA Hockey's Girls Try Hockey for Free Day on Oct. 12, an event that caps a week-long campaign to help introduce young female athletes to the sport. Knight met with Boudreau and Ducks captain Ryan Getzlaf prior to practice. When she got on the ice she was seen chatting with center Nate Thompson and assistant coach Trent Yawney before participating in keep-away and shooting drills. She also took part in a spirited shootout battle with goalie Frederik Andersen at the end of practice. "I was like a sponge out there. It was like, 'OK, what can I learn?'" Knight told the Ducks website. "I was watching Ryan Kesler and seeing how he shoots. Getzlaf was teaching me a few little things about the stick and things like that. All of them were really friendly, and I'm so fortunate to have this opportunity. "I felt like a little kid again. I don't know if you saw the smile out there, but I was like, 'Don't smile too much!' It was a great day." Boudreau said he was glad Knight had the opportunity to practice with the Ducks. "She was really, really good," Boudreau said. "There was one play where she unleashed a really hard shot. She has a great shot." The inaugural Girls Play Hockey Night, scheduled for Saturday at Honda Center, is intended to draw attention to female hockey programs supported by the Ducks in Southern California. Representatives from the Lady Ducks hockey team and The Rinks will participate in pregame ceremonies and intermission activities, and Knight will be honored during a ceremonial puck-drop prior to Anaheim's preseason game against the San Jose Sharks. Defenseman Ben Lovejoy considers Knight one of the best hockey players in the world. While attending Dartmouth College he lived in Hanover, N.H., the town where Knight grew up. "She was snapping shots and played well [during practice]," Lovejoy said. "She's the best in the world." Knight thought it was cool to be practicing with Lovejoy. "It was awesome; I remember watching him skate at Dartmouth [from 2004-07]," Knight said. 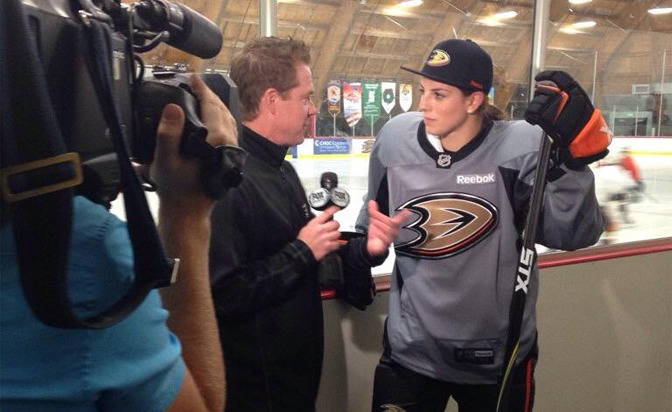 The Ducks believe Knight may be the first female skater to practice with an NHL team. Hayley Wickenheiser, a five-time Canadian Olympian and four-time gold medalist, was a participant at Philadelphia Flyers rookie camps in 1998 and 1999. Manon Rheaume played goalie for the Tampa Bay Lightning in a preseason game in 1992. "I'm one of those women who just likes to push boundaries and continue to push the envelope," Knight said. "I know I have the frame and stature (5-foot-11, 172 pounds) to blend in with some of the guys. It was the opportunity of a lifetime to come out here and skate with them." Boudreau has seven players on his roster who have played in the Olympics: Cam Fowler and Ryan Kesler for the United States; Getzlaf, Corey Perry and Dany Heatley for Canada; Jakob Silfverberg for Sweden; and Sami Vatanen for Finland. As the youngest player on the U.S. team at the 2010 Vancouver Olympics, Knight had seven assists and helped the United States win a silver medal. At the 2014 Sochi Olympics she had three goals and three assists as the U.S. again won the silver. She is scheduled to represent the United States at the Four Nations Cup in British Columbia from Nov. 4-8. Knight was a three-time All-American at the University of Wisconsin. She played in the NCAA championship game all four years (2008-12) and won two NCAA titles. The native of Sun Valley, Idaho, led the NCAA with 45 goals as a sophomore in 2009-10 and helped Wisconsin win the NCAA title. She is the Badgers' all-time leader in goals (143), game-winning goals (30), power-play goals (37) and shorthanded goals (eight). She had 262 points in four seasons.